East Asia and the Pacific have experienced rapid economic and social changes during the past few decades and faced the considerable regulation challenges these changes create for public authorities. UNODC has looked at the manner in which criminal enterprises have developed alongside legitimate commerce in recent years. Overall, UNODC discussed the mechanics of trafficking in a list of 12 illicit flows are organized under four headings: human trafficking and smuggling of migrants; illicit drugs; resources and pollution crime; products (counterfeit goods, fraudulent medicines). An extract from the report looks at the nature of the counterfeit goods market. In today’s fast-paced, globalized world, a significant share of manufactured goods are produced though a decentralized process, making use of a variety of specialized subcontractors. As a result, any given product can be produced by a series of collaborators, and a large number of people can access technical specifications, either directly or through reverse engineering. Gone are the days when manufacturers could shutter their plants and guard trade secrets. Today, those who hold intellectual property rights are often situated half a world away from those who make their ideas come to life. When unauthorized copies of their products appear on the market, it is unclear where to place blame and how to enforce rights. In effect, counterfeit goods are an untallied cost of the growth in offshore manufacturing. Today’s ‘knock offs’ may be made on the same machines by the same technicians who made the originals. Some are simply over-runs, unauthorized production in excess of what is delivered to the rights holder. The products may even be improved, although more often the copies employ cheaper materials, aiming for the lower end of the market. Factory seconds may be re-sold rather than discarded. In most parts of the world, few can tell a copy from an original, so there is very little market for goods bearing the higher price. In a very short period of time, China has become the world’s workshop, producing a significant share of the world’s manufactured goods. Just as China is the source of a large share of global manufactured goods, it is also the source of a large share of counterfeits. Based on seizure data, it appears that at least two-thirds of the world’s counterfeits depart directly from China, while an unknown share may be transshipped though other countries, concealing the origin. Most customs seizure statistics refer to the origin of the shipment (provenance), not the origin of the goods. According to the World Customs Organization (WCO), around 75% of counterfeit products seized worldwide between 2008 and 2010 were manufactured in East Asia, primarily China. In that three-year period, China was the departure point for roughly 67% of worldwide seizures, although the number of items seized declined during that period. Other significant East Asian departure points for counterfeit goods include Malaysia, Thailand, Indonesia, Japan, the Philippines, the Republic of Korea, Singapore, and Viet Nam. 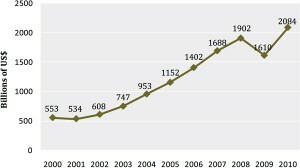 Customs seizure statistics from the United States reflect the same trends as WCO statistics, highlighting the prominence of China as a major source of counterfeit products.2 According to US Customs, China accounted for 87% of the value of the counterfeits they seized between 2008 and 2010. Although European seizures are measured in volumes rather than value, the situation in the EU is similar. Seizures from China also dominate in Australia and New Zealand. WCO seizures are dominated by four categories of products: CDs and DVDs; accessories, watches, and footwear; tobacco products; and textiles. Although statistics are not recorded for many East Asian countries, most casual observers remark on the ubiquity of counterfeits. While software piracy rates in China have declined in recent years, a 79% piracy rate for software purchased in China has been estimated. The use of counterfeit software by Chinese government institutions is considered by some to remain problematic despite ongoing initiatives by China to curb this practice.6 Another recent example of official Chinese crackdown in counterfeit goods operations are the series of raids which took place on in July 2012 on a truly nationwide scale – involving 18,000 officers across 190 cities. The resulting seizures were valued at a total estimated value of US$182 million (equivalent to 1.16 billion yuan). Over 2,000 people were arrested and 1,100 facilities were destroyed. Thailand has also had some success in suppressing counterfeit consumer goods. For example, in 2011, the Royal Thai Police and Department of Special Investigation conducted 9,872 raids and seized 4,561,272 items. In the same year, the Customs Department conducted 581 raids and seized 308,458 items. Also in 2011, the government organized two ceremonies during which 2.1 million counterfeit items – worth approximately US$ 40 million – were destroyed. Because those involved in counterfeiting may also be involved in producing the genuine product, the production processes are similar. Although dedicated counterfeit factories have been detected in large numbers, production is often decentralized, making use of networks of specialists. Sometimes production processes cross borders. 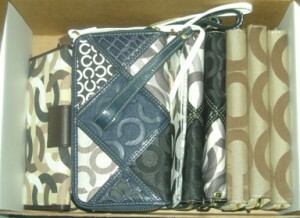 Counterfeit logos may be attached to generic garments and items produced elsewhere. The misbranding of merchandise can even occur in transit countries. As a result, many of those involved in manufacturing counterfeits may have no notion that they are doing anything illegal. At the level of marketing, of course, there is active collusion, or at least willing blindness. As with any market, there are both push and pull factors at work. Those who organize the production of counterfeits may actively seek distributors, making contacts through the Internet or social networks. At the same time, regional distributors may travel to China or contact Chinese firms with specific production requests. A flurry of activity on both sides may accompany major market events, such as sports competitions and the release of new product lines. The complexity of the networks involved in satisfying global demand for counterfeits has made enforcement difficult, but the threat of detection is sufficient that counterfeiters are taking measures to avoid it. To reduce the risk of having their products seized, counterfeiters may conduct ‘just in time’ production, minimizing inventories. To evade detection, goods may also be stored in warehouses, located at a distance from production facilities and registered to front companies. As in many contraband markets, corruption is key. Corrupt officials may sell manufacturing licenses or falsify inspections of goods. At production sites, officials may receive bribes to allow the use of irregular labor or the dumping of hazardous waste. Security officials may be paid to tip off counterfeiters about upcoming police raids. In more extreme cases, corrupt public officials may themselves be members of counterfeiting networks. In the Pacific islands, authorities report several recent cases of corrupt law enforcement officers in the Republic of the Marshall Islands and Tonga facilitating the flow of counterfeit goods in the region. After production, the next phase is concealment and shipping. Counterfeiters can falsely declare goods in order to avoid inspection at border points, or combine fake products with legitimate shipments, particularly for products sourced from ‘back-door production’. Alternatively, brand-name counterfeit goods can be disguised with lesser-known logos in order to avoid suspicion by authorities. For example, in one shipment of illegally manufactured boots seized by US authorities, counterfeiters had covered the fake branded boot soles with non-descript and removable soles. Similarly, in 2010, Czech Republic Customs seized sports shoes from China that had nameless labels sewn over the fake brand-name labels. Circuitous routes used by East Asian counterfeiters to evade detection often involve free-trade zones, such as the Jebel Ali Free Zone in Dubai, United Arab Emirates. The UAE is commonly the provenance of counterfeit goods shipments, despite the fact that very little manufacturing goes on there. Free-trade zones also provide opportunities for counterfeiters to ‘sanitize’ shipping documents in ways that disguise their original point of manufacture. A lack of enforcement in free-trade zones also allows for unbranded goods to be repackaged with counterfeit trademarks prior to being exported to destination markets. There appear to be two primary channels for transporting counterfeit goods. One is by post directly to the consumer, mainly involving Internet purchases. The number of postal detections of counterfeits has increased dramatically in the European Union, although the value of these small shipments constituted only 3% of the total in 2010. This has been ascribed to the increase in Internet commerce. 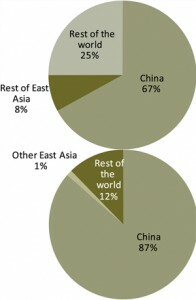 The number has also increased in the US, though much less dramatically. US Customs officials have noted that with Internet based sales, officers have to look harder for less. The second channel generally involves containerized shipment of large volumes of merchandise to be distributed on arrival. 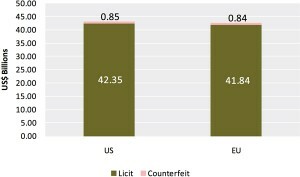 In both the US and the EU, maritime shipments comprise the bulk of the value of counterfeits seized. The WCO does not consistently report on shipment methods in its IPR and Customs Reports, but at least some 2010 WCO data affirms the pattern seen in the US and EU. For example, 59% of the value of total seizures from East Asia in 2010 came from seaborne container shipments, even though there were 654 mail seizures compared to only 433 seaborne seizures. Other sources also demonstrate that most counterfeit seizures are made on bulk cargo and seaborne cargo Since so much of counterfeiting involves the same production mechanisms and the same transportation modes as legitimate manufacturing, a large, dedicated organization is not required. Anyone can contract a Chinese textile mill to produce 10,000 shirts and another to produce 10,000 brand-name patches. The shirts can be shipped by container to a free-trade zone and the patches dispatched by post to the same location. Irregular laborers can be contracted to affix the patches to the shirts, and the product can be shipped to Europe through any of the major ports, where, despite remarkable enforcement efforts, only a small share of counterfeits will be seized. It helps, of course, to have experience in manufacturing the goods to be counterfeited and the technicalities of international shipping, but more important are connections to producers and distributors. The key players in counterfeit markets are essentially brokers and logisticians, connecting supply and demand. They invest the money, coordinate production and transport, unload the merchandise, and reap the rewards. On arrival at destination, nationality-based or ethnic networks are often important for receipt and distribution. Expatriates from South Asia, East Asia, and West Africa appear to be particularly important. Wholesale distributors may offer both licit and illicit merchandise. At the distribution end, some of these goods may be sold through mainstream retail outlets, often variety stores in depressed areas, while others are sold through street vendors and at flea markets. Street distribution often requires the consent of territorial organized crime groups in destination countries. Rather than organizing the trafficking, most often these groups license distribution, levying a ‘tax’ on vendors. In some cases, these groups may buy bulk merchandise at a discount and arrange distribution through their own networks. The poor and heterogeneous quality of data related to seizures does not allow accurate calculations of the actual size of the market for counterfeit goods. Therefore, it is important to refer to statistics related to the legitimate trade worldwide and to combine this information with other studies on crime patterns. If we limit the scope of this analysis to the flow of counterfeit goods from East Asia to EU and the US it is possible to depict a credible picture. In 1997, the Counterfeiting Intelligence Bureau of the International Chamber of Commerce estimated global counterfeiting at approximately 5-7% of world trade. This proportion is widely used in anti-counterfeiting analyses but has been criticized as an overestimate based on limited empirical data. Comprehensive research by the Organization for Economic Co-operation and Development in 2008 and 2009 concluded that counterfeiting accounts for around 2% of world trade.